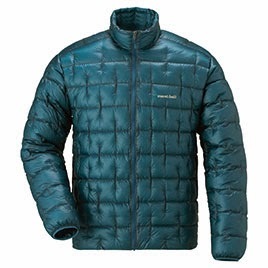 Which weighs more: 10 tablespoons of water or this ultralight down jacket? Answer: jacket. How do they shave the grams down to such a ridiculous sub-5-ounce weight? Let’s take a look. Finally, the jacket does away with anything that might add extra grams. Its only “accessories” are a front zipper and elastic cuffs on the wrists. No pockets, drawstrings, Velcro closures, or anything else. As for me, I’m always intrigued by the latest efforts to create the lightest-ever gear and I’ve always been impressed by the ultralight offerings from MontBell. And though the Plasma 1000 is interesting from a grams-saving perspective, the jacket I’ve got on my covet list is the MontBell U.L. Down Parka, which offers a lot more warmth for less price ($175, 9.0 ounces) and for less additional weight than another 10 tablespoons of water.